After the healing process a crown, bridge, or denture is secured to the implant. A dental implant is a substitute for a natural root. Implants are usually made of titanium, a metal that is well-tolerated by the body. Over time, the jawbone becomes firmly united with the implant. Crowns, bridges or dentures can be attached to the implant by screws or clips. Dental implants look and feel like your own teeth. Since dental implants integrate into the structure of your bone, they prevent the bone loss and gum recession that often accompany bridgework and dentures. Replacing missing teeth is essential to your overall dental hygiene as a gap leaves the remaining teeth unsupported. These may drift along the jaw line, reducing the spaces between them; they may become weaker, making brushing and flossing more difficult. Missing teeth can change the shape of your face and make you look older and less healthy. There are several implantation systems that our doctors use. 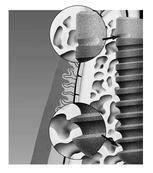 Alpha-Bio has been available since 1988 as a major manufacturer and distributor of dental implants. Since the early years, Alpha-Bio has been operating a highly professional and very innovative research and development team. Alpha Bio was acquired by Nobel Biocare leading dental implant producer in April 2008. The implants, prosthetics and accompanying aids manufactured by Alpha-Bio naturally integrate into the body, reduces the recovery period, circumvents complications and provide durability for years. The Straumann SLActive is the newest dental implant system available and combines the outstanding technological precision of their German manufacturer with a number of key innovations that reduce treatment time and the risks of infection. Although they are more expensive than other dental implant systems, they allow us to offer a complete treatment from dental implant to crown within only 3 months. In some cases it is possible to achieve the crown fitting within 1 month.